At Harley Street we offer specialist testing and treatment for a wide range of allergies in both adults and children. 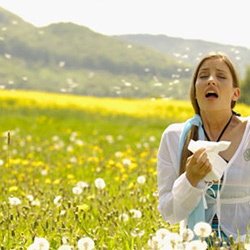 These include the most popular allergies such as pollen, dust mites, shellfish and animal fur. The name given to the cause of this hypersensitive reaction is an allergen. If you or someone in your family has an allergy then we can help. Our allergy clinics offer a full range of services that include patch testing, immunology testing, lung function testing and a thorough allergy review. They will carry out a series of tests to determine the cause of your allergy before prescribing a course of treatment. An allergy is a reaction by the body’s immune system to a variety of substances, for example, pollen. The immune system releases chemicals which include histamine into the bloodstream where they trigger a range of symptoms that characterise an allergic reaction. These symptoms include a runny nose, sneezing, coughing, watery eyes and a skin rash. The severity of the reaction ranges from mild through to potentially life threatening. A mild reaction causes a rash and cold-like symptoms. A life threatening reaction such as anaphylactic shock causes swelling of the air passages, a drop in blood pressure and difficulty in breathing. This severe reaction requires immediate medical attention. Contact with certain chemicals, household products and perfume. There are less well-known allergies such as mould but the list above contains allergies which are most commonly treated at our clinics. Allergies are treated by any of our allergy specialists (or immunologists) who are world leaders in their field. They draw upon their knowledge and experience to prescribe a course of treatment which is suitable for your particular allergy. This includes a diagnosis of the allergen followed by treatment. In some cases, the cause of an allergy is easy to spot, for example, a substance which triggers a rash when handled. But other allergens require a more detailed approach. Another option is homeopathic remedies such as natural bee honey which reduces the intensity of the reaction. Lifestyles changes such as a healthy diet, exercise and reducing stress levels can also help.